Russel riding strong. Russel typically rides with Jen and Brett, his friends from Delaware. Today he had a change of pace and spent the second half of the ride with me. I enjoyed his company and his riding style, while learning about the State of Delaware, where I don't think I have ever been! Today was a long but fun day filled with unexpected twists and turns. No sign of rain again. Cooler temperatures 67 to start, rising to 85 degrees but lesss humid. Headwinds still out of the North East 10 -15 and more at points. In LaCross I was able to meet briefly with Brent Welch and his lovely wife Marianne. They drove over to see me at the hotel. It was great seeing both of them again. We spent six years serving The International Forum's board togethe in the late 90's. I regret that I forgot my camera! A scene from our big 8 mile detour today. They all ran up to their gate as I peddled by baaaahing loudly. Mariah took another hit today. Riding up a 1 mile steep hill young speedster Derek Miller wants to sprint against me to the top (why me?). We take off and I’m right with him, pulling away and Mariah’s chain snaps. I crest the hill, dragging the chain on the ground behind me and coast a half mile to the bottom. Russel from Delaware stops to wait with me for help. We can only reach the voice mails of the SAG wagons (good thing I wasn’t in a serious accident). Twenty minutes go buy and the Good Samaratian, Richard Pauls from Oklahoma stops to see if he can be of assistance. 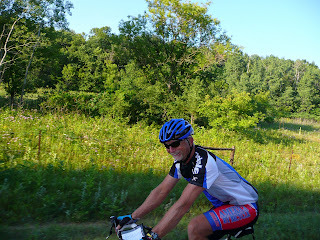 It turns out that Richard has traveled extensively by bicycle. Most of his trips he has been “self supported” (no SAGs) and he really knows how to be prepared. He whips out exactly what we need to McGiver Mariah back into action. With his multi-tool that included an appropriate chain tool we were able to remove the bad link, shorten the chain slightly and put Mariah back in the game. 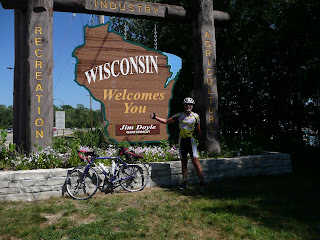 We finished the ride uneventfully (a few gears I couldn’t use, but otherwise just fine.) So thus far I’ve not missed an inch of the ride. Russ and I were able to catch back up with the Miller family after our 40 minute hiatus and get into town ok. I thought I would stop at the suggested local bike shop but they could only refer me to another shop farther away. I made it there and they had a new chain and helped me get the bike back in great working order. 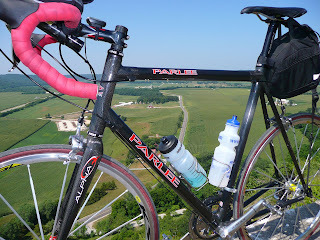 I also replaced a water bottle that bounced out somewhere along the ride unbeknownst to me. 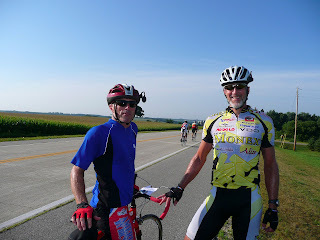 Rich Simpson and I prepare for a big descent with a big view. A bike ride with a big view! We crossed the Mighty Mississippi today, climbed up to a really high scenic overlook. We rode about 40 miles on a very nice rails to trail path that wasn’t bumpy unlike most of the other roads we’ve experienced in Minnesota. Click above for a slide show the things I saw that I was able to capture on my camera. WHAT NICE HELPFUL PEOPLE ON YOUR RIDE. i COULDN'T CLIQUE ON YOUR TUBE AS IT WASN'T LIT UP.